Everyone has an opinion, anecdote, or horror story about women and work. Now the acclaimed author of What the Most Successful People Do Before Breakfast shows how real working women with families are actually making the most of their time. “Having it all” has become the subject of countless books, articles, debates, and social media commentary, with passions running high in all directions. Many now believe this to be gospel truth: Any woman who wants to advance in a challenging career has to make huge sacrifices. She’s unlikely to have a happy marriage, quality time with her kids (assuming she can have kids at all), a social life, hobbies, or even a decent night’s sleep. But what if balancing work and family is actually not as hard as it’s made out to be? 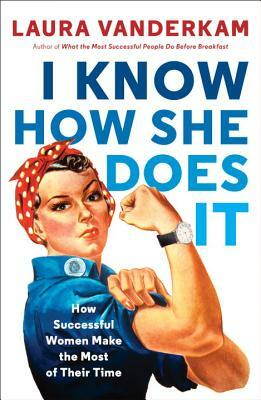 What if all those tragic anecdotes ignore the women who quietly but consistently do just fine with the juggle? tracking their time. They went jogging or to the gym, played with their children, scheduled date nights with their significant others, and had lunches with friends. They made time for the things that gave them pleasure and meaning, fitting the pieces together like tiles in a mosaic—without adhering to overly rigid schedules that would eliminate flexibility and spontaneity. Vanderkam shares specific strategies that her subjects use to make time for the things that really matter to them. For instance, they . . .
* Work split shifts (such as seven hours at work, four off, then another two at night from home). This allows them to see their kids without falling behind professionally. * Get creative about what counts as quality family time. Breakfasts together and morning story time count as much as daily family dinners, and they’re often easier to manage. * Take it easy on the housework. You can free up a lot of time by embracing the philosophy of “good enough” and getting help from other members of your household (or a cleaning service). * Guard their leisure time. Full weekend getaways may be rare, but many satisfying hobbies can be done in small bursts of time. An hour of crafting feels better than an hour of reality TV. With examples from hundreds of real women, Vanderkam proves that you don’t have to give up on the things you really want. I Know How She Does It will inspire you to build a life that works, one hour at a time. LAURA VANDERKAM is the bestselling author of What the Most Successful People Do Before Breakfast, All the Money in the World, 168 Hours, and Grindhopping. She is a frequent contributor to Fast Company’s website and a member of USA Today’s board of contributors. Her work has also appeared in The Wall Street Journal, The New York Times, Fortune, and other publications. She lives with her husband and their four children outside Philadelphia. —RICHARD SHERIDAN, CEO and chief storyteller, Menlo Innovations, and author of Joy, Inc.